The Life Fitness T5-5 treadmill offers a suite of challenging training workouts as well as on-the-fly-programming, deluxe touch sensitive controls, and a spacious 22" x 60" running area. Like all of the company's cardio machines, this one is built rock solid and can definitely take a licking. The Life Fitness T5-5 treadmill features backlit TouchSensor buttons which are programmed for easy intuitive access and on-the-fly programming. There is a workout profile window plus six message areas providing feedback. The electronic readouts on the deluxe Intellidisplay™ console include incline, speed, time, distance, target heart rate, time in HR zone, calories, and pace. The programs include Classic Workouts (Manual, Hills, Random, EZ), Sports Training (Time, 5K, 10K), 9 Heart Rate, and 4 Custom workouts per user. 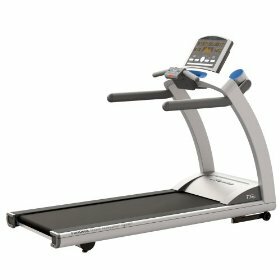 Weight / Dimensions: 320 lbs / 32" x 59" x 80.25"
UPDATE: The Life Fitness T5-5 is no longer being sold, and has been replaced by the all new T5.0 treadmill. The new model offers you two different console choices for customization, as well as some upgraded features that make the machine more durable and comfortable to use. Check out the new T5.0 if you are looking for something similar to the T5-5 treadmill. The treadmill is an upgraded machine from the T5-0 model, and features additional programming and more advanced electronics. The health-club quality components include a quiet, smooth 3.0 CHP MagnaDrive motor, which is automatically adjusted by the console to the precise power you need depending on your weight. The Life Fitness T5-5 also features ergonomically-placed control pad within easy reach, Touch Sensor™ keys with blue LED backlighting, and GoSystem™ one-touch Quick Start, speed and incline presets, and accurate wireless heart rate monitoring. Underfoot, the patented FlexDeck® system with nearly indestructible Lifespring shock absorbers provides optimal support and flexibility while running or walking. Life Fitness engineers their machines to be the ideal match of features, quiet motors, and comfortable decks so that runners will want to run indoors instead of going outdoors for daily workouts. The T5-5 treadmill’s extra wide 22" x 60" running surface and max user weight of 400 pounds can handle even the largest user. 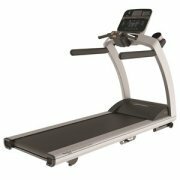 The Life Fitness T5-5 does just about everything right: it has a sleek contemporary design, large tread belt, excellent power and cushioning, low noise, quality components, and a deluxe console. It all sounds ideal — but not for the $4,199 retail price tag. In the $4,000-plus range of treadmills, you should compare it closely to several competitors as well as other Life Fitness models in the T and F series which seem to offer better price-to-value ratios. The Life Fitness T5-5 treadmill is a solid high-end machine, but it would be a better deal if it were priced several hundred dollars under the $4k mark.